The Pacific Academy of the Healing Arts is proud to announce that our founder and director Elizabeth Bush, MSN, APRN, CARN-AP, CSAC, received the 2010 Excellence in Advanced Practice Nursing Hillman Award. The recipient of this award is an individual who embodies the role of the advanced practice nurse as a master clinician, researcher, consultant, and/or educator. The award was given at the Annual Hillman Alumni Nursing Network Reception at the Penn Club in NYC on December 9th, 2010, an event that pulls together Hillmans from all the programs supported by the Rita and Alex Hillman Foundation…students, alumni, faculty, the deans, and foundation board members. Ms. Bush is an alumnus of the University of Pennsylvania. She holds a Master of Science in Nursing and is board certified as a Psychiatric Nurse Practitioner and as a Psychiatric Clinical Nurse Specialist. She is also board certified as a Certified Substance Abuse Counselor (CSAC) and Addictions RN in Advanced Practice (CARN-AP). Her areas of expertise include detoxification, Post Traumatic Stress Disorder and other Psychiatric and co-occurring disorders. 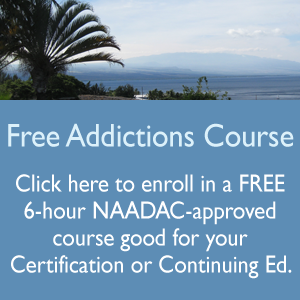 The Pacific Academy of the Healing Arts (PAHA) is a NAADAC-recognized educational provider for professional addictions training. The academy offers courses through an on-line learning model, as well as face-to-face courses on the Big Island of Hawaii. PAHA is currently offering a free 6 credit online course in “Understanding Alcohol for the Addictions Professional” for all new users on their site which can be used for certification or recertification requirements. Visit www.addictionsprofessional.com for more information about Elizabeth Bush or our online academy.